We searched the world over for the finest organic lavender essential oil, and after testing dozens of options, we finally found this exquisite oil. 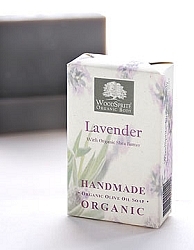 A true classic, our uniquely beautiful Bulgarian Lavender soap is scented with pure essential oil and is tinted purple with natural rattanjot root. This best seller also contains Organic Shea Butter for a supremely moisturizing lather. Ingredients: Saponified Oils of *Organic Extra Virgin Olive, *Organic Coconut, *Organic Palm, *Organic Sweet Almond & *Organic Castor; Pure Essential Oil of *Organic Bulgarian Lavender, Superfatted with *Organic Shea Butter; Rattanjot Root. (*Certified Organic) Most skin types. (*Certified Organic) Most skin types. 4 oz. wt.